SEATTLE, WA--(Marketwired - Apr 6, 2016) - MOD Pizza, the pioneer of fast casual pizza, is sprouting a new addition to its simple menu of endless options -- the Cooper, an artisan-style pizza tailor-made for spring that features seasonal roasted asparagus along with red peppers, Italian sausage, red onion, ricotta and mozzarella cheeses and fresh basil. Now through June 30, customers can order the Cooper at one MOD's 116 locations nationwide. "The Cooper highlights fresh asparagus that is roasted in-house daily and bursting with fragrant flavors. We're also bringing back a real crowd-pleaser with this pizza -- ricotta cheese," said Brian Figler, culinary manager at MOD Pizza. "We love showcasing seasonal vegetables that we hope will encourage people to experiment with ingredients they may not immediately associate with pizza. Whether customers try the Cooper or add roasted asparagus to their own pizza or salad, our goal is to continually mix it up at MOD." In addition to the Cooper, guests can order any one of MOD's nine classic, handcrafted and custom-made pizzas or build their own creation choosing from more than 45 signature sauce, cheese and topping options -- all for one price. MOD also offers salads, milkshakes, fresh-brewed iced teas, lemonades and local craft beer and wine, where available. MOD currently has locations in 16 states, including Arizona, California, Colorado, Idaho, Illinois, Maryland, Michigan, Missouri, New Jersey, North Carolina, Oregon, Pennsylvania, South Carolina, Texas, Virginia and Washington. 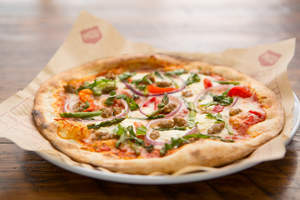 For more information about MOD Pizza and the Cooper, please visit http://www.modpizza.com. MOD Pizza is the pioneer of the fast casual pizza segment, founded in Seattle in 2008 by entrepreneurs Scott and Ally Svenson. MOD's individual artisan-style pizzas are made on demand, allowing customers to create their own pizzas and salads, using fresh-pressed dough, signature sauces and over 30 toppings, for one price. With more than 115 locations across 16 states, MOD is committed to creating a positive social impact in the communities it serves, by not only creating a cool place to eat, but an inspired place to work. In 2015, MOD earned a spot on the Inc. 5000 list as one of the fastest growing private companies in America and was recognized by Fortune as one of the "20 Best Workplaces in Retail" for its progressive hiring practices, career growth opportunities and workplace benefits. For more information, please visit www.modpizza.com or connect with the brand via Facebook, Twitter or Instagram.